Graeme Base makes the list twice. There's also one by Lynne Cherry who I think used to live in my town, though I wouldn't want to swear to it. Make your comment in order to be considered for the Saving the Planet & Stuff giveaway. 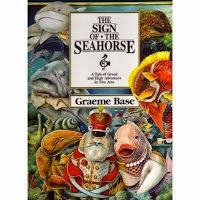 The Sign of the Seahorse is one of my favorite books. The illos are marvelously kid appealing, and the story and plot are such fun to read in rhyme. Graeme being another Aussie is also a plus for me - even though I now live in Oregon, I am an Aussie at heart. The oceans where this is set are in great danger, and his story will make kids very aware of the beauty and life that they must save when they grow up, because this generation is not doing very much to save it.